The von Neipperg family have been growing vines and making wines in the Württemberg region of Germany for some 800 years. The family began acquiring estates in Bordeaux in 1971 and Stephan von Neipperg came to live permanently in Saint-Emilion in 1983. The family are part owners of first growth Château Guiraud in Sauternes, as well as full owners of six other wine estates in Bordeaux – Chateau Canon La Gaffeliere (Saint-Emilion Premier Grand Cru Classé), La Mondotte (Saint-Emilion Premier Grand Cru Classé), Chateau Clos de l’Oratoire (Saint-Emilion Grand Cru Classé), Chateau Peyreau (Saint-Emilion Grand Cru), Chateau d’Aiguilhe (Côtes de Castillon), and Clos Marsalette (Pessac-Leognan) – along with the Capaia winery in South Africa’s New Philidelphia region… and the Bessa Valley winery in the Pazardzhick province of Bulgaria. I visited Bulgaria for the first time two years ago (indeed, this was my first time in Eastern Europe) to attend the Digital Wine Communication Conference. This took place in Sofia and Plovdiv. I did, on that occasion, tour several wineries, but not in the Bessa Valley. Because of the Bordeaux connection, I very much wanted to bring back a bottle of the von Neipperg wine, but did not come across any in the wine shops I went to. Well, lo and behold, I was delighted to see that Cave Briau (owned by the Borie family of Ducru-Beaucaillou), a 3-minute walk from my house in Bordeaux, are selling the wine, at the modest price of 10.50 euros! 2013 Enira consists of 55% Merlot, 21% Syrah, 9% Cabernet Sauvignon, and 15% Petit Verdot. It has a ruby-red color with some brown tinges on the rim. The nose features some simple, but attractive black fruit aromas and obvious oak ageing. The wine starts out on the palate very much like a New World wine (14.5% alc./vol. ), but goes on to reveal Old World subtlety and restraint. A nice combination. The aftertaste is not particularly long, but this is a good, sound wine that constitutes a real conversation piece! And it is definitely good value for money. 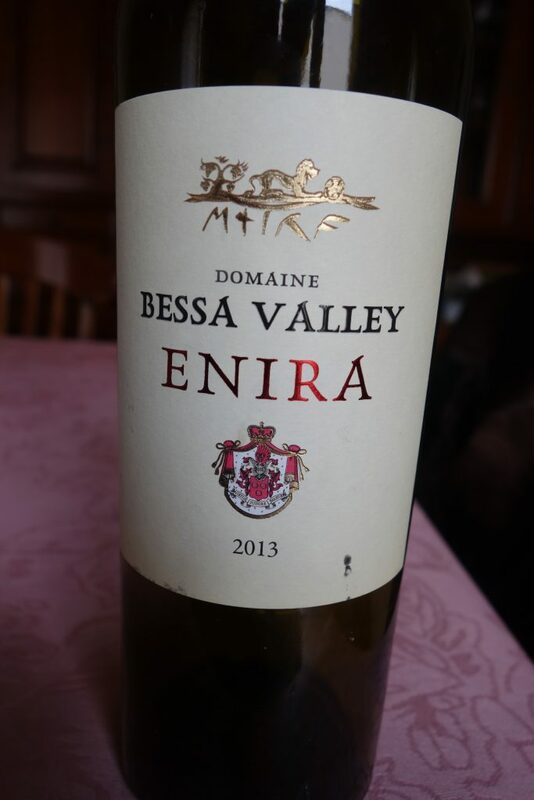 I’ll be interested to try this Bessa Valley wine in future vintages, and also to taste their top-flight cuvée. Posted in Uncategorized and tagged BulgarianWine, bulgarianwines on March 28, 2018 by AlexR.